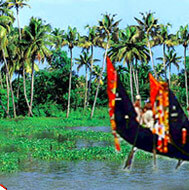 The boat races festivals in Kerala are popular event and draw thousands of spectators every year. 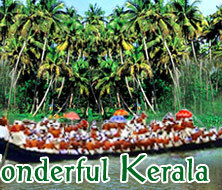 Kerala is a land known for its great cultural heritage, art, and adventure. The boat races of Kerala form an important part of the tradition of folk arts. With a long coastline, the sea is so very important to the social, economic, religious, and cultural life of the people. The economic life of the people, residing in coastal areas, is very much sea dependent, thereby boats form an important part of their life. For centuries, boat races in these parts of Kerala have become a symbol of social and cultural harmony. These boat races also speak about the adventurous and competitive spirit of the people of Kerala. The boat races teach the essence of life to live in harmony with people as well as nature. Kerala's winding stretches of backwater are famous for their native boat races, which are held every year during the harvest season. The boat festival season begins with the centuries-old Champakulam boat race, which marks the beginning of a month of festivities. The boat races signify the excellent team spirit, integration, and amity of the people of this backwater land. 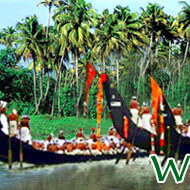 The boat races are occasions of great excitement and a reflection of vibrancy of the people of Kerala. In the boat races, a boat is manned by four helmsmen, 25 singers, and 100-125 oarsmen who row in unison to the fast rhythm of the Vanchipattu (song of the boatman). It is an amazing site as thousands of people gather at the waterfront to cheer the huge black crafts as they cut their way through the waters to a spectacular finish. Many of these boat race festivals in Kerala have curious legends and myths attached to their origin. Aranmula Boat Race is one of the most popular events in Kerala. It is a two-day event and is more of a water fte than a competition. Held every year, on Pamba River near the Sree Parthasarathy Temple, as a part of Onam celebrations (August/September), it is interesting to note that the boats do not race against each other; instead, they row in unison to the accompaniment of songs and reach their destination together. People throng the shores of River Pamba to watch the magnificent cluster of snake boats called 'Palliyodams'. Payippad Boat Race is held during August/September on Payippad Lake, 35 km from Alappuzha, and is one of the major snake boat races in Kerala. The race is held every year to commemorate the establishment of the deity at the Subramanya Swamy Temple, Haripad. 'Chundanvalloms' or snake boats are the main highlights of the Payippad Boat Race. The swift 'Chundanvalloms' racing through the blue, crystalline waters are, indeed, a treat to the eyes of the spectators. The Nehru Trophy Boat Race is the most famous of all the boat races in Kerala. This annual festival is held on the Punnamada Backwaters of Alappuzha district on the 2nd Saturday in the month of August. This boat race is held to commemorate the visit of the first Prime Minister of India, Pandit Jawaharlal Nehru, in 1952, and celebrate seafaring and soldier-like traditions of Kerala. This spectacular race features magnificent snake boats or 'Chundans'. The lively and rhythmic boat songs or Vanchipattu draw the spectators to a state of frenzy. Champakulam Boat Race held at Champakulam, about 26 km from Alappuzha, is the oldest and most popular boat race in Kerala. Linked to the establishment of the deity in the Sree Krishna Temple at Ambalappuzha, the race is held at the Champakulam Lake on the moolam day of the Malayalam month Midhunam, the Champakulam Boat Race is the first one of the season. The festivities include spectacular water floats, decorated boats, Vanchipattu, the song of the oarsmen, and the most thrilling Chundanvallom race. Chundans are a type of boat, which are over 100 feet in length with raised prows. The Rajiv Gandhi Trophy Boat Race is held two weeks after the Nehru Trophy Boat Race. The venue of the Rajiv Gandhi boat race is Pulinkunnu, on the backwaters of Alappuzha District, 10 km away from Alappuzha. This boat race is organized in the memory of the late Prime Minister of India, Rajiv Gandhi.